Wayne’s World is the best of the Saturday Night Live movies. Oh, there are those who will tell you it’s really The Blues Brothers or maybe the relatively recent MacGruber. There are even a few sick freaks who might cite A Night At The Roxbury. 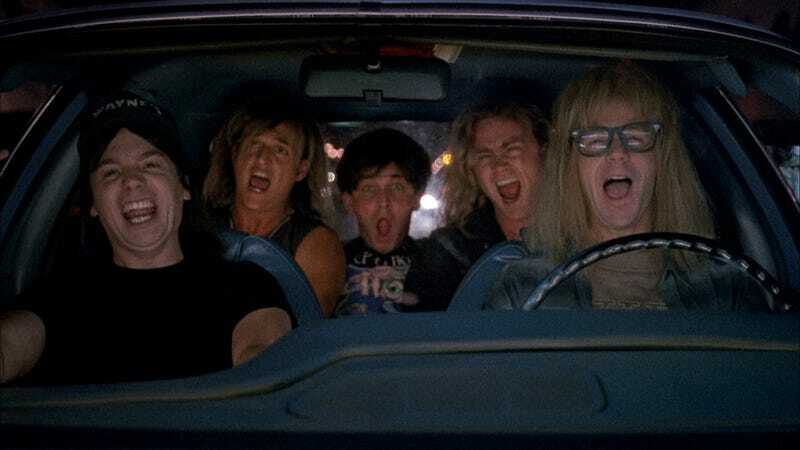 But let’s be real: In quotability, in laugh count, in gleeful irreverence, none can match the first big-screen outing of basement TV headbangers Wayne Campbell (Mike Myers) and Garth Algar (Dana Carvey). The “Bohemian Rhapsody” scene alone rockets it to the top of the SNL spinoff pantheon. Here’s another thing about Wayne’s World: It created a brief national fascination with public-access television, which looks today like a kind of precursor to the amateur exhibitionism of YouTube. The topic was explored at greater length in an episode of Popcorn Politics, the A.V. Club video series created by Scrappers Film Group, which gets into some of the cultural, social, and philosophical issues raised by hit movies. Wayne’s World turned 25 earlier this year, and in honor of its birthday, The A.V. Club will co-host a screening of the film—as well as the accompanying Popcorn Politics installment—at the ArcLight Chicago on Monday, December 11. Senior editor and Wayne’s World superfan Marah Eakin will also moderate a post-screening discussion with a panel of experts, including Joe’s Basement host Joe Winston, on how the movie both honors and savages public-access entertainment. Tickets to the event can be purchased here. Come watch this comedy classic on the big screen with The A.V. Club. Because here’s one more thing about Wayne’s World: It plays great with a crowd. Note, again, that glorious car-ride Queen singalong.